I believe every holiday needs a “krispy” treat. This is my ode to Christmas in Rice Krispy form. 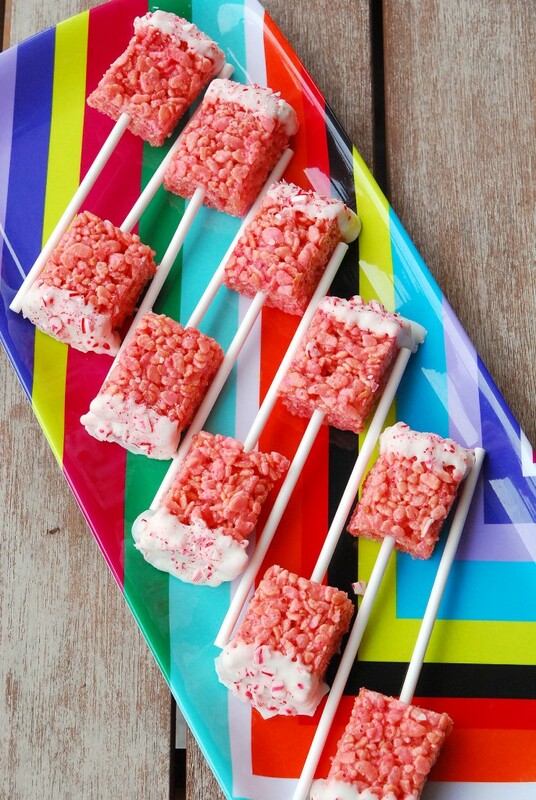 It is made slightly cuter than the average Krispy treat because it’s cut smaller, thinner and plopped on a stick. I made these for a cookie exchange last year and they were the first thing to go. Really, these couldn’t be cuter. And (thank goodness) they’re delicious. Crispy, sweet, peppermint-y with a smooth marshmallow finish — these are the perfect foil to all the rich chocolate cookies and fudge on your cookie table! Line a 9×13-inch pan with foil, leaving a 2-inch overhang on the sides. (This will make it easier to remove from pan and cut.) Spray the foil with nonstick cooking spray. Melt the butter in a large stock pot set over medium-low heat. Once the butter is melted, stir in the peppermint extract and salt. Add all of the marshmallows and stir the mixture constantly until the marshmallows are completely melted. Remove from heat and add the cereal, using a rubber spatula or wooden spoon to coat the cereal evenly with the marshmallow mixture. Quickly stir in half of the peppermint baking chips. Spread the mixture in an even layer in the prepared baking pan; let cool 15 minutes then press remaining peppermint baking chips in to top. (You don’t want them to melt, but still want them to stick to the bars.) Let cool for an additional 30 minutes before slicing. Slice into rectangles and insert popsicle or large sucker sticks. 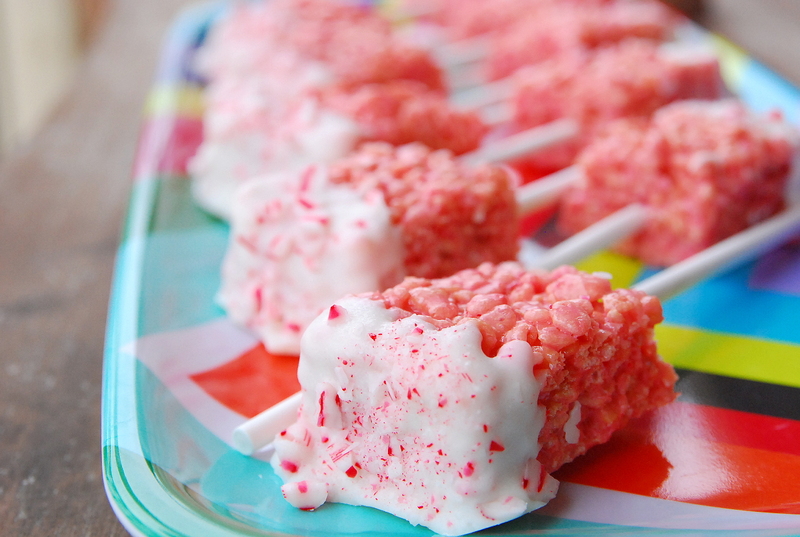 Dip in melted almond bark and sprinkle with crushed peppermints. Let set completely before serving.